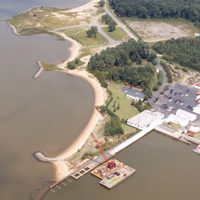 Problem: Shore erosion of Ft. Eustis Training Shore also known as "Anzio Beach"
This project was designed by U.S. Army Corps of Engineers, Norfolk District and VIMS using primarily shoreline geomophology as a measure of dominant wave approach. Installed in 1995, the system armored existing headland features (old landing craft) with stone and built an additional headland breakwater and large spur to enhance/create large stable pocket beaches. An area of low elevation was left in existing headland to preserve an intertidal marsh.